Jim Yahn turning a valve wheel. Photo by Havey Productions via a screenshot from TheDenverChannel.com. House Bill 17-1233 (“HB 1233”), titled Protect Water Historical Consumptive Use Analysis, accomplishes three objectives: (1) to expand application of a preexisting law to water Divisions 1, 2, and 3; (2) to clarify that participation in a government-sponsored program includes water conservation pilot programs; and (3) to limit state agencies that can approve a water conservation program to only those with explicit statutory jurisdiction over water conservation or water rights. Democratic House Representative Jeni Arndt of District 53, located in water Division 1, and Republican Senator Larry Crowder of District 35, located in water Division 2, introduced HB 1233 in the House on March 7, 2017. The House approved the bill on March 24, the Senate approved an amended version on April 17, and Colorado Governor John Hickenlooper signed HB 1233 on May 3. A historical consumptive use analysis is part of a proceeding to change a water right. A water right owner may only change that right up to the amount of water historically consumed for a beneficial use. Prior to HB 1233, Colorado law provided that in Water Divisions 4, 5, and 6, historical consumptive use analyses were not to consider reduction in water usage resulting from participation in a government-sponsored water conservation program. In the initial draft of HB 1233, the sponsors sought to apply this rule to all seven of Colorado’s water divisions. However, at the Senate second reading, the Senate passed Senator Crowder’s proposed amendment to remove water Division 7 of southwestern Colorado from the bill. Senator Crowder explained that feedback from the representative from that water division led him to propose the amendment. Barr Lake State Park photo via Colorado Parks and Wildlife. HB 17-1291, 71st Gen. Assemb., 1st Reg. Sess. (Colo. 2017) – (allowing water users to store water in a place of storage not listed on the decree if the historical consumptive use of the water right has been quantified in a previous change). House Bill 1291 (HB 1291) has also been called the “Another Reservoir on the Ditch” bill. Co-sponsored by House Representatives J. Arndt, J. Becker, and Senator D. Coram, the bill was introduced to the House on March 24, 2017, and signed into law by Governor Hickenlooper on June 5, 2017. Without any lobbyists or other organizations involved in its preparation, the bill was recognized by legislators and the public alike as a “common-sense” piece of legislation. The bill allows water users to store previously quantified water in an alternate place of storage not listed on their decree without going through water court in certain circumstances. The benefits of HB 1291 are only available to water users who want to store their decreed water in alternate storage on the same ditch or diversion system (including in nontributary aquifers). The water that qualifies under the bill is limited. It must be attributable to a water right that: (i) has gone through a judicially approved change; (ii) has been decreed for storage; and (iii) has a quantified historical consumptive use. Additionally, the water must be diverted at a point of diversion already decreed for that water right—it cannot be imported from another division—and any applicable transit and ditch losses must be assessed against the water right. After these changes, what remained of the bill was (what was originally) subsection (a). It provided a clear legislative assurance of the validity and preservation of those previously decreed existing water rights that were for aesthetic, recreational, and piscatorial uses. The final bill also protects conditional water rights—rights that have been filed with and decreed by the water court prior to actual use while securing an earlier priority. This bill ensures that owners of conditional water rights for aesthetic, recreational, and piscatorial uses will not face objections based on the St. Jude’s ruling when they return to the water court for diligence or perfection. The final bill was designed to preclude an overly broad application of the St. Jude’s Co. ruling and to protect recognized rights. While the parties involved did not agree on everything—as reflected in the multiple amendments—in the end, HB 1190 was a bipartisan consensus effort to address an area of law that had been left unsettled by the Court’s St. Jude’s ruling. Illustration shows water availability, in blue circles, compared with demand at various places along the South Platte River. The yellow area is the study area. (Illustration by Stantec). 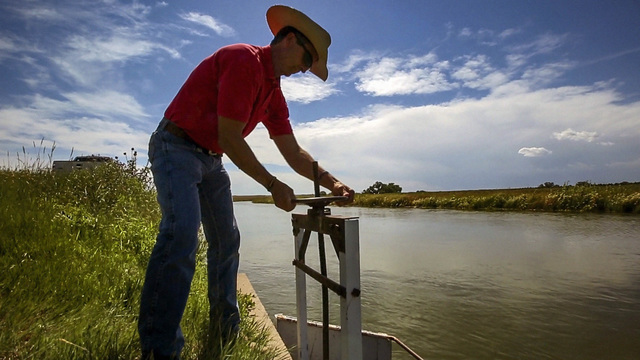 A yearlong study centered on a decades-long trend of Colorado sending too much water to Nebraska via the South Platte River yielded dozens of potential storage projects. But high costs, potential environmental impacts, and bureaucratic and regulatory hurdles could doom the road ahead for any of those possibilities, according to a study presented Tuesday night at the South Platte Basin Roundtable meeting in Longmont. Further, even if several of the identified projects happen, they would barely put a dent in what’s expected to be a Front Range water needs gap of 500,000 acre feet per year. The $200,000 study, ordered by the Colorado State Legislature and paid for by the Colorado Water Conservation Board, looked at the South Platte from Greeley to the state line and identifyed potential storage solutions along the way. A large amount of water is physically and legally available but only during wet years and during short periods. Mainstream options have the most benefit but likely are not permittable and have significant social impacts. Many off-channel options appear to be feasible and could be combined in different concepts. Even multiple projects won’t make a big dent in the supply gap. One reason for the lack of impact is how the South Platte works. When farmers divert water from the South Platte to irrigate crops, some of that water soaks underground and slowly moves back to the river. That’s called a return flow, and return flows feed the South Platte to allow it to flow long after snowmelt water is gone for the season. That’s why the Sterling No. 1 ditch can completely dry out the river with a diversion and then a mile downriver it’s flowing again. That’s why the best possible place for a reservoir would be near the Colorado-Nebraska border, and the best solution for keeping as much water as possible — a mainstream reservoir — is the solution that likely never will happen. 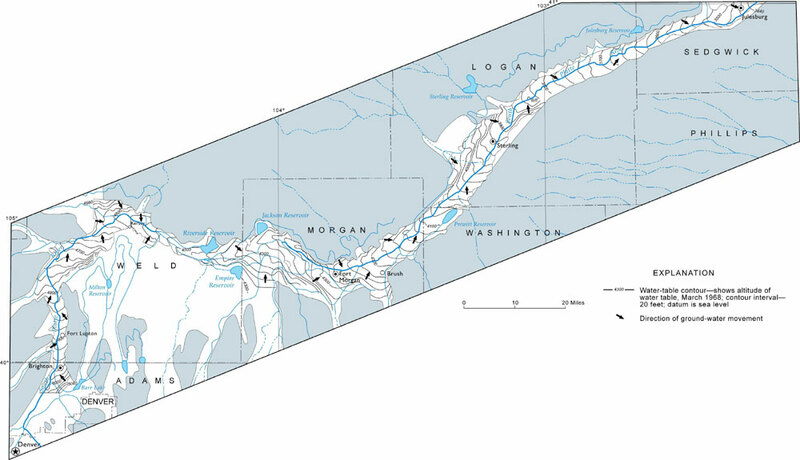 A mainstream reservoir along the South Platte essentially would be a lake on the South Platte, with the western portion feeding into the lake and the eastern portion running when the lake releases water. Water experts agree that would be nearly impossible to get approved. But the consultants did identify storage options away from the river, including old gravel pits. Still, building ditches or pipes to fill those gravel pits would prove costly. The consultants also talked about the 2013 flood and high flows in 2015, which ended up sending 1.9 million acre feet of water to Nebraska — exponentially more water than Nebraska is entitled to via the 1923 compact with Colorado. But managing or diverting water during a flood event like that would take technology water experts said just doesn’t exist. Instead, ditch companies did everything they could to keep the flood water out of their ditches, lest they get damaged by the torrent. Groundwater storage also was touched on, but concerns were raised about water losses and the co-mingling of other water rights. Once the water flows under another landowner’s property, for example, they would have the right to pump that water to irrigate crops. The conversation circled back to the reason for the study. 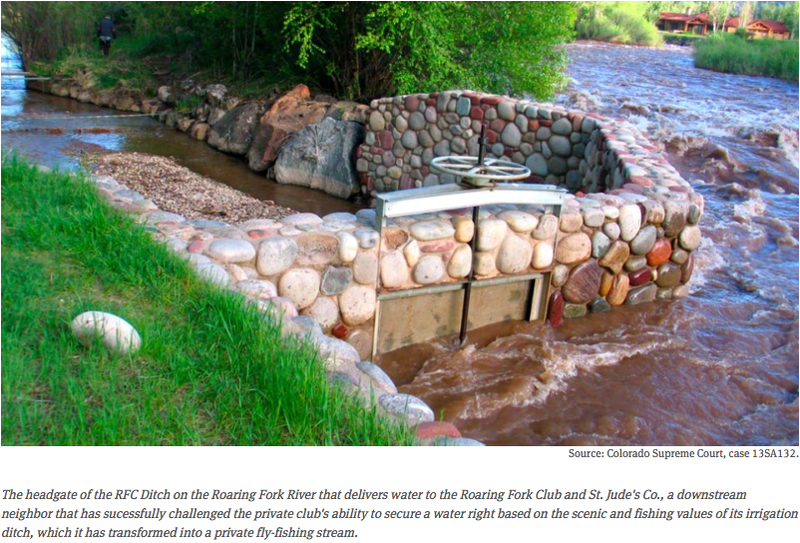 Essentially, lawmakers on the Western Slope long have pointed to the excess water the Front Range sends to Nebraska. Rather than divert more water from the Western Slope, the argument goes, Front Range farmers and municipalities need to figure out how to keep what they have. Mike Schimmin, a water rights attorney on the roundtable, said his fear is the study will reinforce those feelings and that people will ignore the high cost to capture the extra water. That takes us to what happened to that 8 million acre-feet of water on the South Platte. It went to Nebraska. There’s a compact, like a contract, between Colorado and Nebraska, dating from 1923, that dictates that a certain amount of water from the South Platte goes to Nebraska, which preserves the river’s downstream environment and aquatic wildlife. The 8 million acre-feet exceeds what Colorado was legally required to send to Nebraska. But the problem for Colorado is that there’s no place to put that water. Lawmakers and water experts have been jawing about the lost water problem for years. In 2016, Rep. J. Paul Brown of Ignacio sponsored a bill to put some teeth into the conversations, by asking how much water is being lost to Nebraska and where it can be stored. The final answer won’t be known until the end of this year, but earlier this month, an interim water committee at the state Capitol took a first look at the data and some of the sites where storage might happen. It’s not an easy conversation. Building new reservoirs takes decades and often has to survive lawsuits and complicated federal and state permitting processes.. Look at the Northern Integrated Supply Project near Fort Collins, which could lead to a new reservoir and expansion of a second. The project is in its 14th year and will likely take another five or six years to get through all the permitting. In the life of a reservoir, that’s short. Compare that to the Animas-La Plata reservoir in southwestern Colorado, where construction was declared finished in 2013. The project began construction in 1968. 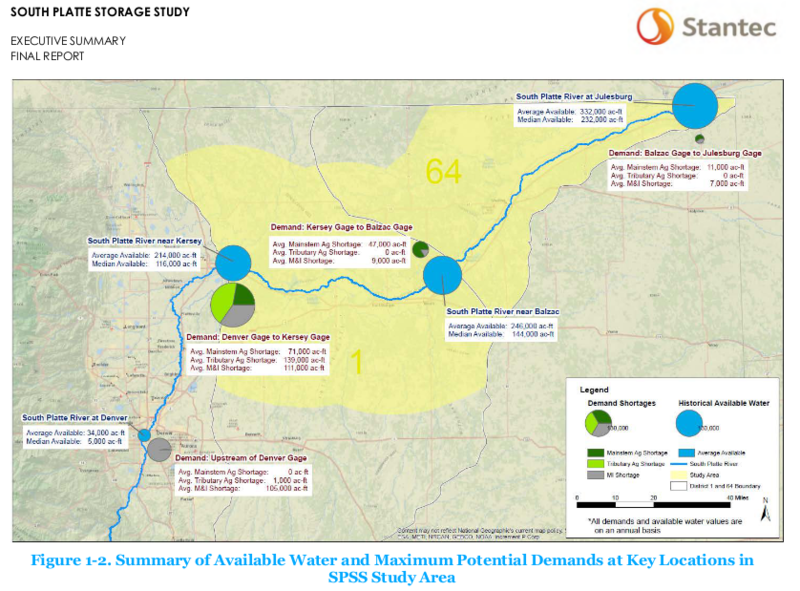 While new storage is definitely possible for that South Platte water, other storage ideas are being considered in the study. According to Andy Moore, a senior water resources specialist with the Colorado Water Conservation Board, the state’s primary water agency, 147 sites were identified on first blush for water storage. Those sites fall into three categories: new reservoirs, rehabilitating and/or expanding existing reservoirs, or refilling underground storage. That’s water that would be pumped into aquifers, which are underground rock formations that hold water. Colorado has four major aquifers, with the three largest all along the Eastern Slope. In 2000, the South Platte aquifer, according to the Colorado Foundation for Water Education, served about 70 percent of the Front Range population. The site list has been pared down several times, to eliminate sites too far from the main body of the South Platte or for sites that were too small to be useful. That leaves 16 sites, mostly in northeastern Colorado. Over the next several months, those sites will be evaluated for cost, benefits and other factors. The first look at possible storage along the South Platte was welcomed by Chris Treese, external affairs manager for the Colorado River Water Conservancy District, the water agency in charge of the Colorado. “The Western Slope has long thought that as Coloradans we’re in the water world together, but every basin should look to own resources and capabilities first before looking for outside resources,” he said. Rep. Jeni Arndt of Fort Collins, a Democrat who chairs the House Agriculture, Livestock and Natural Resources Committee, favors refilling aquifers first and looking at other possibilities next. Arndt sponsored a bill, signed into law this year by the governor, that allows the state engineer to set up rules for the use of water that is pumped into nontributary aquifers. Those are aquifers not connected to surface water, like rivers. Refilling aquifers, Arndt told Colorado Politics, is environmentally friendly, with less evaporation and less permitting. It is also practical from a political standpoint, she said, meaning that there should be less opposition to refilling aquifers than to building new reservoirs. Refilling is “appealing, makes sense, it’s cost effective and it’s politically doable,” she said. Brown was pleased with the study’s first data. “This is the kind of information needed to make good decisions about what to do on the South Platte,” he said this week. He pointed out that the Arkansas, Rio Grande and Colorado rivers all have instream storage, and the only place without it is the South Platte. The Yampa River Core Trail runs right through downtown Steamboat. Photo credit City of Steamboat Springs. Click here to go to the website for all the inside skinny. Concerning the financing of testing for lead in public schools’ drinking water, and, in connection therewith, making an appropriation. The bill directs the department of public health and environment (department) to establish a grant program to test for lead in public schools’ drinking water. The department will give the highest priority to the oldest public elementary schools, then the oldest public schools that are not elementary schools, and then all other public schools. The department may also consider ability to pay in administering the program. The department is directed to use its best efforts to complete all testing and analysis by June 30, 2020. The public school must provide at least 10% local matching funds and give the test results to its local public health agency, its supplier of water, its school board, and the department. The department may use up to $300,000 per year for 3 years for grants beginning on or after July 1, 2017, from the water quality improvement fund if there is money available after fully funding existing programs. The department shall provide 4 annual reports to the general assembly regarding implementation of the grant program, including any legislative proposals that may be warranted. The bill appropriates $431,803 and 1.3 FTE to the department of public health and environment for the implementation of the act. House Bill 1306 received bipartisan backing and plenty of support from school and health officials. Lead in drinking water can lead to long-term health problems in children. The measure is aimed primarily at older elementary schools with the hope that all public schools will be tested and the results analyzed by June 30, 2020. The bill authorizes the state Department of Public Health and Environment to establish a grant program to test the drinking water in public schools that use a public water system. As much as $300,000 in grants could be awarded each year for three years, and another $140,000 would be spent to implement the program. The measure also requires school districts that test for lead to contribute 10 percent in local matching funds and give the test results to the local public health agency, water supplier, school board and CDPHE. Just seven of Colorado’s 178 school districts have tested their water for lead, and in those districts 100 schools were found to have some lead in their water, health officials said.